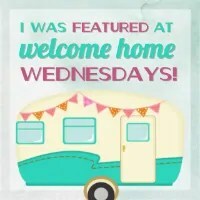 Welcome to Welcome Home Wednesdays #43!!! We’re in the home stretch. Just a few more days until school’s out for summer! I saw a few link parties that are taking the summer off. We’ll be here, so stop by, say hi, and link up your amazing projects and recipes! Speaking of recipes, here are a few Simple Patriotic Recipes for your 4th of July BBQ or potluck. Gotta love the red, white and blue theme! Like any good hosts we’re sitting right by the present table waiting until our guests leave so we can go through the loot… the loot being your Welcome Home Wednesdays #43 links! We can’t wait to check out what you’ve left for us. Trust me there will be a lot of pinning, tweeting and facebook sharing going on in the near future… we can’t wait to show off what you’ve left! Thanks Erin for featuring my Strawberry, Blueberry, Jicama Salad in this weeks party. I look forward to linking up each week and finding great content and making new friends. Thanks for coming and partying with us, Celeste. You’re salad was beautiful and healthy. Have a wonderful day! Thank you for coming by and linking up more of your great projects, Dee! I hope you have a wonderful rest of your week! Thank you for hosting. Don’t forget to take the time to enjoy the day! You’re so right, Marilyn, we need to take time to enjoy each and every day! Wishing you a wonderful day! Hi Erin! It’s hard to believe that summer is here, isn’t it? The year is simply flying by! Thanks to you and the ladies for hosting- have a great evening and enjoy the rest of your week! Thanks for coming by, Cindy! Love seeing what you link up! Have a wonderful rest of your weeks as well! Thank you so much for hosting it! Thank you for linking up with us, Debbie! We love seeing you here!